New base station introductions in the run-up to 5G pose challenges depending on both their timing relative to competitors’ moves and their messaging relative to legacy products. All major RAN vendors have faced challenges unveiling new base stations recently, including Huawei, which was forced to make big changes in response to shifting market demands. Everywhere you look, people are talking about the coming migration to 5G mobile networks. A much less talked about – but perhaps no less challenging – transition is the one radio access network (RAN) equipment vendors are making from base stations that were optimized for LTE to ones designed to lead operators into the 5G era. Yet, in the waiting period before 5G’s true arrival, marketing new base stations aimed at future networks alongside the current generation of base stations is a balancing act akin to stepping from an unmoored boat to a pier. At Mobile World Congress earlier this year, Huawei promoted a new baseband unit that it had already been marketing quietly for several months. The vendor claimed that the BBU5900, part of the broader CBS5900 base station, would embody the CloudRAN vision of 5G networks that Huawei had set forth in 2016, in that it was software-upgradeable to a split architecture with virtualized control functions. In other words, some control functions could be run on commodity servers, whether Huawei’s or another vendor’s, driving down costs and increasing network efficiency by centralizing the coordination of large numbers of radios. As 2017 progressed, Huawei eventually revealed that market requirements had changed as it was developing the CBS5900 and the operators (or operator) which had expressed interest in that partially virtual architecture had subsequently had second thoughts. This summer, Huawei began marketing (quietly, again) a new base station: the BTS5900 (or, in main/remote form, the DBS5900), which uses the same BBU5900 debuted at MWC, with increased capacity and other features – but without those split-off virtualized control functions. The new gear is compelling, to be sure, but doesn’t amplify the CloudRAN story so central to Huawei’s 5G messaging the way the CBS5900 did (the ‘C’ stood for ‘cloud,’ after all). When Ericsson introduced its Ericsson Radio System in early 2015, it enjoyed the benefits (especially attention) of unveiling new gear before its top rivals did, but it opened itself up to charges that the portfolio was designed too far in advance of 5G standards to be 5G-optimized. When Nokia launched its AirScale platform the following year, it had an easier time avoiding the ‘too early’ charge, claiming AirScale had been designed far enough along in 5G’s development as to have incorporated its key attributes. But, the vendor confronted thorny messaging challenges in trying to promote the new gear without implying a limited lifespan for the previous generation of base station, the Flexi Multiradio 10 (thus it juggled the terms ‘4.5G Pro,’ ‘4.9G’ and ‘5G-Ready’). ZTE, the last of the top-four RAN vendors to introduce a wholly new base station in recent years, unveiled the ‘IT BBU’ at this year’s Mobile World Congress, with promises of virtual control capabilities reminiscent of Huawei’s CBS5900. 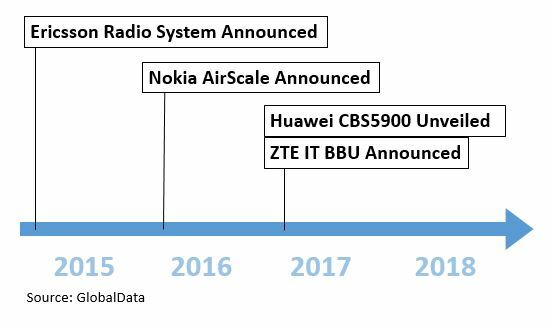 Aside from charges that it’s trailing competitors with an unproven offering, when the IT BBU becomes available in Q2 2018, will it encounter the same market headwinds as Huawei’s CBS5900? We’ll see; in the meantime, ZTE has upgraded the performance of its existing B8300 eNodeBs, giving it a highly competitive position. Piecemeal Can Be Practical. A solution doesn’t have to be complete to move forward. Ericsson introduced the ERS first, then added 5G software plug-ins a year later, and later still radio hardware to complement it all. Nokia claimed AirScale was ‘5G-ready’ based on the idea that a few core attributes could meet that definition, with the finer points fleshed out over time. Message Timing Tradeoffs. Each vendor’s messaging should claim advantageous timing. Earlier solutions indicate thought leaders and are more mature and proven. Those that come next leapfrog the thought leaders in terms of capabilities. Those that come last leapfrog again while offering maximum lifespans for legacy gear. Don’t Neglect Legacy Portfolio. No one wants their technology investments to become obsolete too early. Continuing to enhance existing products is worth it, even if it crowds claims that the new gear is superior; effective messaging can remedy this dilemma, and a compelling long-term evolution story is key. The Market Can Change Its Mind. Focusing too much on a single attribute or concept can be differentiating but risky if operator sentiment shifts. The power of new technologies can be dulled if the market isn’t quite ready for them yet. Next postGoogle Fiber: Will Gigabit Wireless, and Going Long, Keep It Relevant?